By the Engineering staff of Femtosim Clinical Inc. This article was originally released in August 2005 to coincide with the "50th anniversary" of the appearance of commercial physiologic monitors. Since then we have updated and expanded the content. We invite you to comment on this subject and, please; send us an image of an "experienced" monitor from your facility for inclusion here. Sponsored by KaleidoSim 2 and KaleidoSim 2 Prime: The serious kaleidoscope simulation available on Android. Physiologic monitors have been in regular commercial production since about 1954. Therefore, in recognition of those first 50 years, we have compiled a history of these interesting devices and present some of our guesses as to where this technology is headed. This history of physiologic monitors looks at the technical evolution of physiologic monitors which incorporate a cathode ray tube (CRT) or flat panel display and that normally would be used in a hospital setting. Please note that the text below includes comments on monitors used currently and in the past and does not comment on others and this and any information herein is not meant to be construed as an endorsement or condemnation of any devices and are opinions of the authors. Although specific systems are mentioned in connection with new developments, this does not imply that the system was the first or the only system with that feature. We have endeavored to be accurate with the dates provided in relation to the appearance of certain systems or features. Himmelstein and Scheiner reported in a 1952 paper that in January of 1950 they began using an instrument they devised. They called it the “Cardiotachoscope” and found it useful during surgery. It featured the fundamental attributes that most monitoring systems would eventually have. These attributes include a CRT to view the ECG, a heart rate indicator, alarms for high and low heart rates, and a connection to a conventional electrocardiograph for printouts. This device does not appear to have entered into production and the “Cardiotachoscope” term is not used anymore. Within a few years of this original paper, commercial monitors began to appear and eventually they and their manufacturers proliferated by the end of the decade. Monitors of this era were often referred to as electrocardioscopes or cardioscopes. Sometimes they were simply referred to as an oscilloscope. Unlike modern monitors, devices of this era had monochrome displays and the persistence of the wave was generally not sufficient to cover the screen. This meant that the ECG waveform would show only a second or two of new data. The old data would fade away and the trace has been described as a bouncing ball with a comets tail. Some CRT’s were of the “long persistence” type which meant that fading was slower and more waveform was visible. There were no numeric parameters or annotations on the screen. Modern bedside monitors and modern defibrillator/pacers are distinct types of equipment. Systems of the 1950’s and early 1960’s made less of a distinction between the equipment roles of monitoring and defibrillation or pacing and were often intended to be used together as a diagnostic and, especially, therapeutic whole at the bedside or in the operating room on a mobile cart. Equipment used in this sense is more closely related to what we currently find on a hospital crash-cart: a defibrillator/monitor with integrated non-invasive pacing. Some equipment of this type could be set to automatically pace the patient when the heart rate dropped to a set rate. In fact, detection of low heart rate and initiation of an alarm or therapy was a primary objective of this technology. The frequency response of the ECG monitor was often less than comparable electrocardiographs of the period. This meant that detailed ECG assessment still required the electrocardiograph. The advantage of the monitor was the immediacy of the information and the ability to generate alarms. Most devices had an output connector to allow direct printing on a standard electrocardiograph. Most bedside type monitors often had round screens of about 5 inches in diameter. Some had only 3-inch diameter screens. Most bedside monitors were limited to one or two waveform traces. The diameter of the screen (in inches) was often incorporated as part of the devices model number. Controls on these monitors generally allowed for lead selection, focus adjustment, intensity or brightness control, sensitivity or gain control, vertical trace-position control, and sweep rate adjustment. These type of controls are closely related to the controls of traditional oscilloscopes used in electronics. The use of flammable anesthetics during this period necessitated design considerations to prevent occurrence of a spark. This involved encasing the device in an “explosion proof” (they would not cause an explosion by releasing a spark) housing or, later and more commonly, in accordance with the NFPA “Hospital Code” of the era, by mounting the monitor at an elevation of at least five feet above the floor and thereby above the anesthetic gases which tended to settle to the bottom of the operating room. A challenge with monitors of this era was the presentation of heart rate information. Many early units did not provide a cardiotachometer or rate-meter to provide a heart rate. However, the use of audible (or occasionally visual) R-wave indicators and grid lines inscribed on the CRT face provided the clinician with a means to calculate a heart rate. Some monitors had an integrated cardiotachometer in the form of an analog meter and this became increasingly prevalent in the next decade. 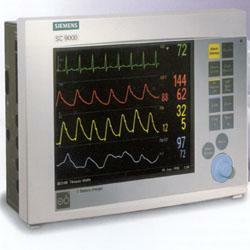 A cardiotachometer was available as an add-on piece of equipment or module with some systems. A prominent early device of this decade was the Cambridge Operating Room Cardioscope from the Cambridge Instrument Company. This device was intended for operating room use and appeared about 1954. The display included a small CRT screen and analog indicators behind the round glass portal of a torpedo-shaped explosion proof housing. The entire device was mounted on a stand. Electrodyne played a prominent role in this era and this continued into the next decade. The model PM-65 which appeared around 1956 incorporated a cardioscope mounted on top of a large pacemaker. This device introduced physiologic monitors into a clinical setting (intensive care area) as opposed to being a dedicated operating room device. Electrodyne devices were developed, in collaboration with engineer Alan Belgard, by the renowned Dr. Paul M. Zoll whose name continues to be associated with defib/monitors with non-invasive pacemakers. Several monitoring companies marketed new devices beginning around the year 1957. These included Dallons, Sanborn, and Levinthal. The monitors from Sanborn and Levinthal were similar in physical appearance with a 5-inch diameter CRT mounted below two knobs and above three other knobs. 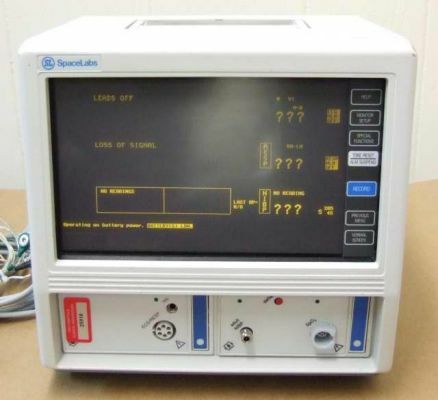 The Levinthal Electronic Products Inc. device was called a “Duo-Trace Cardioscope” and was capable of displaying two waveforms simultaneously. The Sanborn unit was configured as an operating room model 169-A-OR “Viso Scope” and mounted high on a stand. The CRT trace was a bright yellow color. A two waveform version was available for an additional cost. Dallons released a large cardioscope in 1957 and variations thereof were marketed until the mid-1960’s at which time it was replaced by a more compact system. The unit included a separate “cardiophone” device mounted on top whose audible output was related to the rate and morphology of the ECG. The 1960’s featured monitoring systems whose intended functions and configurations were surprisingly similar to more modern systems. The approach of having central monitors and bedside monitors was common even from the early part of the decade. Numerous parameters were technically available to be monitored including ECG, EEG, invasive pressures, and temperatures. However standard parameters were restricted usually to ECG and a more elaborate setup would be necessary for more parameters. Modular pre-amplifiers were available from the vendors to deal with various combinations of patients and parameters. Monitoring of the EEG was a common feature of monitors of this decade and was used to assess depth of anesthesia during surgery. EEG monitors did develop as dedicated stand-alone devices. The process of using telemetry to monitor physiologic signals occurred early in this decade as well. Litton Systems offered a telemetry system which used the standard FM frequency band in the early 1960's. Marketers were happy to point out that their systems, such as the Vector Guardian system (Division of United Aircraft), incorporated the same technology for telemetry as used in Space flight. Unlike modern central monitors which are distinct pieces of equipment and capable of displaying waveforms from eight or more bedsides simultaneously, in the early part of this decade central monitors were often identical to the bedside monitors. The “central” would be connected to all of the bedsides by cabling in a star pattern to a separate switching box which would allow data to be switched over one bed at a time for viewing on the central. This would usually only transmit the waveform and not alarm or other information. This might only involve one waveform. Other more sophisticated monitors used for a central monitor or for surgery had traditional 17” diagonal television tubes which were occasionally mounted in a vertical “portrait” orientation and could display a waveform from eight different beds for example. Some centrals included a tape memory section to record the ECG. Vendors such as Burdick, Birtcher, Dallons, Air Shields, and Electrodyne offered a complete line of pacemakers, defibrillators, and physiologic monitoring systems (with a central) in the early 1960’s. Electrodyne replaced the PM-65 system of the 1950's by the Electrodyne “Pacemaker-Alarm-Monitor” PMS-5. The PMS-5 monitor is mentioned in the literature as being used in some of first Cardiac Care units of the early 1960s'. The PMS-5 had an integrated pacemaker section and was marketed until about 1968. The venerable Electrodyne PMS-5 shelved at a high elevation. Note the Electrodyne TR-3 pacemaker on the table at right. Early 1960's. 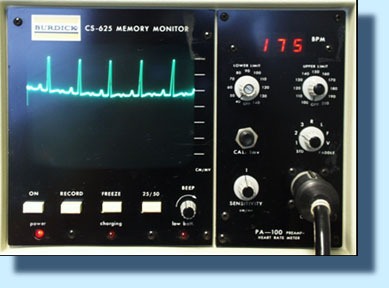 Electrodyne PMS-5 Cardiac monitor and pacemaker system. Dallons released a twin-beam cardioscope in 1960 and this was mentioned and pictured in the flight surgeons report following the Mercury-Redstone missions 3 and 4. The cardioscope was used for pre-flight checking of the space suits biomedical sensor systems. Dallons also subsequently released a couple of versions of its twin-beam unit in the form a fetal/maternal ECG monitor and as an ECG/EEG monitor. An explosion proof monitor, the CS-3X, was released in the early 1960’s. The unit was of tubular shape of 5” diameter and nearly 20” long. In the mid 1960's Dallons released a new and more compact monitoring system ("Master Monitor") which incorporated an "exclusive" full ECG lead selection dial. This allowed for selection of one the ECG leads: I, II, III, AVR, AVL, or AVF. The monitor had a three-inch diameter or optional five-inch diameter circular display. Many monitors of this decade did not have a full ECG selection dial and might allow selection of one of three leads or none at all. With no lead selection options, the user would establish the lead to be viewed based on the electrode cabling connection arrangement applied on the patient. It should be noted that disposable flexible electrodes appeared in the middle of the decade. In the mid to late 1960's the Datascope "Carditron" and the Electrodyne MS-25L, for example, included a selector switch for viewing one of 12 leads. The Dallons Twin Beam Cardioscope of 1960. At 48 pounds it still weighed less than some bedside monitors appearing years later such as the Spacelabs PC of 1985. In the mid 1960's, several vendors offered a magnetic tape "memory-loop" feature that served to continuously record the last 15 or more (depending on vendor) seconds of data so that alarm events could be interpreted based on the preceding data. Automatic printing of stored data following an alarm could occur. This concept has persisted and is used with modern systems albeit digitally. By the mid 1960’s most prominent vendors offered equipment in modular pieces which included separate devices for central monitoring of alarm conditions. The modular pieces could each consist of devices for heart rate indication, temperature indication, pacing, tape memory, etc. These modular pieces would slide into a larger rack. In the mid 1960’s, Sanborn (Later Hewlett Packard) offered modular pieces in self-contained enclosures instead of rack mounted modules. In 1966, Sanborn even offered a numeric readout accessory module for blood pressures, temperatures, and heart rate. Digital readouts were achieved using Nixie tubes up until the early to mid-1970’s and were then replaced by LED displays. In the early 1960’s, Electrodyne released the S-3A and MS-21 ECG monitors. These devices were relatively compact with their round 3-inch diameter screens and they did not incorporate pacemakers. The MS-21 included an analog gauge indicator for heart rate. Larger (five-inch diameter screen) equivalents of the S-3A and MS-21 were the S-5B and MS-25 respectively. 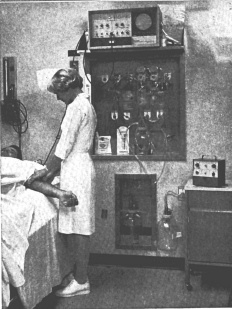 The MS-35 which appeared in 1967 included connections for synchronized placement of external “counter-shock” when used with the Electrodyne DS-95M defibrillator. The Electrodyne RM-2 from the mid-1960's was used centrally for monitoring of two patients and incorporated two significant features: an audible QRS indicator tone and a variable alarm delay feature to reduce false alarms from motion artifacts. The QRS tone was also available with the Electrodyne MS-25 of 1967. In order to improve heart rate measurement accuracy some monitors of the latter part of the decade began using specific R-wave detection circuits which would filter out baseline wander and artifacts arising from patient movement and could discriminate against P and T waves. These included the GE series 9000, American Optical Cardio-care systems, and the Datascope Monitron. The Electrodyne PMS-5D and the American Optical Cardio-Care monitor of the mid to late 1960s' incorporated a demand pacemaker instead of an asynchronous pacemaker. Although transistorized equipment such as the Electrodyne TR-3 pacemaker appeared in the late 1950’s, much equipment, such as the MS-21 monitor, was not transistorized in the early 1960s’. Instead they continued to use vacuum tube technology since this technology was mature, high performance, and reliable compared to transistors of that era. " Solid state" equipment (along with imitation wood veneer on equipment housings) began appearing on a more consistent basis beginning around 1968. Some exceptions to this were the Sanborn 760 series and the RecorDisplay from Invengineering which had "transistorized" preamplifiers early in the decade. Equipment using vacuum tube technology required a longer warm-up time than solid state devices. From around 1966 onwards the demise of the three and five-inch circular display began. Vendors began incorporating a new type of CRT which was larger and rectangular. A rectangular shape is better suited for the display of multiple waveforms than a round CRT. Spacelabs introduced the Model 170-1103 oscilloscope in 1966 which featured an eight inch (diagonal) monitor. In 1968, Hewlett Packard released the Model 7803A “Monitorscope” which had a similarly “large” screen. Significant, with this latter device was the heart rate information which was displayed using the CRT. A horizontal line would progress across the bottom of the screen with the heart rate as a bar graph. The screen itself was imprinted with graduations and numerals to allow reading of the heart rate. This approach to heart-rate presentation would be used by various vendors into the next decade. Honeywell also introduced a bedside monitor with a seven inch display in 1969. The decade of the 1970’s saw some significant improvements in the presentation of the displayed waveforms and information. This was a result of the incorporation of digital electronics and, eventually, microprocessors. Real time (centrally controlled and processed) arrhythmia analysis appeared at the beginning of the decade and evolved over the duration of the 1970’s. Standards documents which established minimum performance criteria for physiologic monitors began appearing from several bodies such as the "Specification for Biomedical Monitoring Systems" X-1414 of 1970 from the Veterans Administration. The appearance of the so called “Memory Monitor” occurred at the beginning of the decade. These monitors incorporated analog to digital converters and small memories to briefly store several seconds of incoming data. The stored data was then used to define the display on the CRT. The advantage of this scheme was that the stored data could be written to the screen quickly and repeatedly at the same location well before it would fade out resulting in a “non-fade” persistent display. Waveform data was presented either as a moving wave that scrolls from right to left or as a stationary waveform that is overwritten by the trailing left edge of a narrow "eraser bar" which travels from left to right. Modern monitors use one display method or they permit selection of either of these modes of display. Some memory monitors also allowed data to be cascaded. This meant that an ECG trace would continue on the line below thereby providing more visible information over a greater time period. The display of most memory monitors could also be stopped or “frozen” for review of the appearance of a particular waveform. Also, printing or viewing of several seconds preceding an alarm condition was possible with some systems. Electrodyne claims to have introduced the first non-fade patient monitoring system, the “Computa View”, around 1970 and claims to have dominated the non-fade market in the early part of this decade. An “advanced" Computa View was introduced in 1972. The Burdick CS-625 Memory Monitor. Note the red numerals are used for the heart rate and the limited space for multiple waveforms. Circa. early to mid 1970's est. The Westinghouse patient monitoring system of 1970 featured an “exclusive” heart rate computer with automatic gain control. This system as well as others from this period, such as those from General Electric and Mennen-Greatbatch, began incorporating isolated ECG inputs for patient electrical safety. Isolated inputs would extend to all monitored parameters within a few years. The beginnings of arrhythmia analysis occurred in the 1970’s and relied upon the connection of an ancillary computer. In 1970, Smith Kline Instruments offered monitors which could interface to a computer and could be used for PVC detection and other tasks. The instruments also had integrated numerical displays on the front panel. Mennen-Greatbatch and American Optical offered systems in 1972 whose arrhythmia computer would learn normal ECG’s; a feature common with modern systems. The American optical system detected ectopic beats, prematurity, delay, compensatory pause, and atypical morphology. 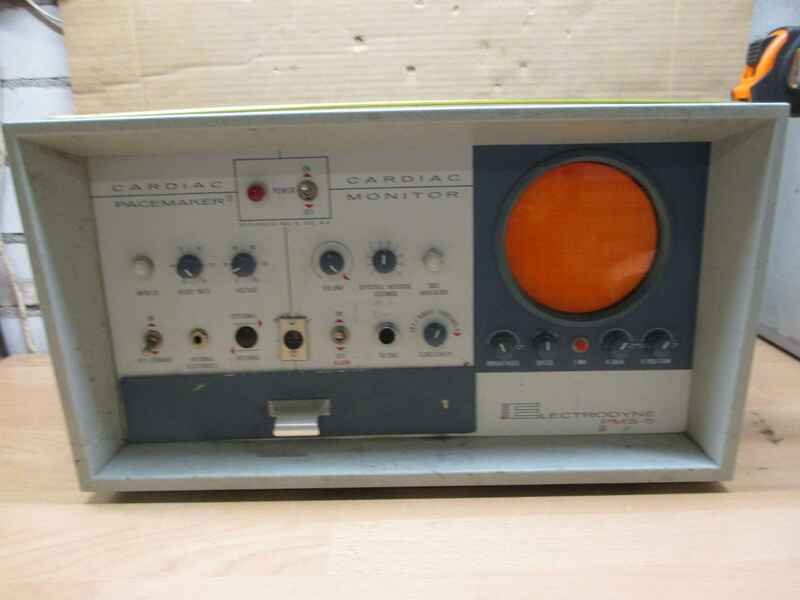 The Mennen-Greatbatch model 515/G Cardio/Sentinel monitor of 1972 included pacemaker spike detection and rejection capabilities. The Siemens Sirecust 300 DU of 1978 offered pacemaker spike rejection and could still permit viewing of the spikes but would not count them. The unit also featured high frequency protection from electrosurgical equipment. Although the bouncing ball display was fading from the scene, HP resurrected an incarnation of its 1968 era Model 7803A “Monitorscope” as an economical operating room monitor (model 7833A) around 1978. Variable sweep speed selection became commonly available beginning around 1973 with the SE laboratories SEM 432. Sweep speed selection usually included 25, 50, and sometimes 100 mm/s speeds. Although analog gauge indicators were still in use, the display of heart rate information was often accomplished by a horizontal bar graph type indicator which was integrated with the CRT display as appeared late in the previous decade. The CRT bezel was inscribed with a graduated scale indicating the heart rate. Some monitors of the early 70's, such as the HP78330A, over-laid parts of the heart rate bar graph with thicker lines in those regions where the high and low alarm limits were set. Even though central systems from Abbott, GE, Gould, and Smith Kline had numeric indicators in the early 1970’s, this approach was more commonly used for heart rate on bedside monitors later in the decade. The Birtcher 7000 “Monitorscope” from the middle of the decade used a vertically oriented bar graph and a separate digital display for heart rate information. In 1975, BD-Electrodyne released a monitor which had LED displays for both heart rate and pressure values. The middle of the decade saw the introduction of microprocessors and thus the beginning of modern monitoring systems. Spacelabs claims to have launched the first (bedside) monitoring system which incorporated microprocessor technology in 1974. Among other things, microprocessors enabled further exploitation of the CRT as a means to display information. By 1978 some vendors such as Hewlett Packard and Philips began integrating the heart rate information on the CRT display as a numeric value (in models HP78341A and HP78342A and Philips model CM-120). In summary, heart rate presentation evolved over the course of the decade from a bar-graph display to a numeric LED display located next to the CRT on the front panel and then to a numeric integrated with the CRTs’ display. The 1980’s witnessed further significant evolution in patient monitors. Arrhythmia analysis became available at the bedside instead of centrally. Monitors began using color displays, monitoring networks became more sophisticated and monitors became computerized. Since the display size increased in the 1980's, the number of waveforms that could be displayed on a monitor increased over the course of the decade from approximately two waveforms to six waveforms. The beginning of the decade witnessed some new developments in monitors themselves. For example, Siemens introduced the Sirecust Series 400 in 1980. This unit had three notable enhancements: bed-to-bed or “interbed” viewing, parameter modules, and membrane-switch design. The Abbott Lifecare 5000 monitor of 1981 had bed-to-bed viewing as did the E for M Honeywell CM140 of 1981. Bed-to-bed viewing has become a standard feature of modern monitors. It allows the clinician to review another patients’ waveforms and data from a different bedside monitor connected to the monitoring network. This was touted to further improve nursing efficiency by taking away the need to keep returning to the central station to view other patients. Also, patient data could be entered at the bedside rather than at the central. The membrane switch design has become standard with modern monitors and provided a sealed front panel area. This is more hygienic and resistant to fluid ingress. The Siemens Sirecust 404-1 of the early 1980's Note the monochrome screen with integrated numerical information. Modules are on the right. While modularity of monitoring systems had been heavily marketed throughout the previous two decades, the modularity was primarily intended to allow for various initial configurations to be achieved when installing a monitoring system in a particular area. The new “hot-swappable” modularity which appeared in the 1980s’ was meant to allow adjustment of the actual parameters available to be measured from one patient to the next. The advantage of this modularity was economical since by sharing modules with lesser used parameters, such as cardiac output, a hospital would not have to fully load all bedside monitors with all parameters. By the middle of the decade, most monitoring systems offered parameter modules. It should be noted that this role has faded from importance with the increased miniaturization of modern systems which have compact multi-parameter all-in-one modules. Hewlett Packard introduced their modular Merlin system in 1989. Before that time, HP was providing configured monitors. HP promoted a wider patient data management concept for its monitors (HP78707A) from the early part of the decade. Twenty-five years later, monitors are continuing to promote the provision of data management and presentation capabilities beyond simple physiological measurements. Electronic automatic non-invasive blood pressure and pulse oximetry were two new notable parameters which became available in the 1980’s. Also, HP introduced the 47210A capnometer at the beginning of the decade in North America and this parameter evolved to become commonly used as had already occurred in Europe. In 1983, the Burdick Color-Trend monitor (model M565) was introduced. This monitor featured a color screen and would display different parameters with unique colors. Color monitors would still require a few more decades to become standard and were often an optional and costlier proposition in systems of the mid to late 1980’s. It should be noted that Midwest Analog and Digital offered a central monitoring system in 1978 which used color to distinguish individual patients from others on the same screen. Unlike other systems of the period which had the numerical information listed along the right side of the CRT display, the Burdick Color-Trend monitor had Numerical parameters on the left. The Philips CM-120 from the prior decade which became an E for M/Honeywell system in the early 1980’s displayed numerical parameters along the bottom. The Electrodyne STAT-scope IV listed numerics along the top. Most systems have standardized on the default position of numerical parameters to be on the right side of the CRT. (Some more modern systems from Fukuda Denshi, Nihon Khoden, and MDE allow numerical parameters to be displayed on the left). In general, having the numerics listed along the top or the bottom had the advantage of permitting a longer waveform to be displayed. Nihon Kohden claims to have been the first to supply bedside arrhythmia analysis with its Life Scope 10 OEC-5501 Heart Monitor which was introduced in 1982. Spacelabs claims of being the first to allow viewing of real-time arrhythmia data at the bedside in 1979. In any event, by 1980, arrhythmia analysis was primarily available as a centrally coordinated feature of the central monitoring station of many systems such as the General Electric PDS3036, Becton Dickenson Vigilant arrhythmia identification system, and the Hewlett Packard 78220. By 1983, E for M/Honeywell and Marquette offered bedside arrhythmia analysis. The Marquette system 7000 of 1983 boasted simultaneous four-lead arrhythmia analysis at the bedside. The Siemens Sirecust 400 offered bedside “oriented” arrhythmia analysis. ST segment analysis also became available in the middle of this decade. Larger monitor screens began appearing regularly after the middle of the decade. Around 1985, Spacelabs introduced the “PC” bedside monitor which incorporated a relatively large monochrome touch screen and relatively large parameter modules. The PC was replaced with a color screen version, the “PC2”, at the end of the decade. These units could be configured as either a bedside or central which reduced the hardware variety of the system. Generally, however, central monitors would be equipped with a larger display than a bedside monitor. In 1987 Siemens replaced the Sirecust 400 with the Sirecust 1281. The new model featured a larger screen with optional color. Data input is usually achieved by a combination of rotary menu selectors and membrane soft-key switches. Keyboards and mice have not been easy to introduce in the bedside environment due to space and hygienic issues. Touchscreen bedside monitors would become common 25 years later on. Monitors of the 1990s’ became more flexible and efficient in their deployment and setup and began accepting and presenting data from other sources such as medical equipment and hospital departments. Portable monitors evolved to become quite capable and the continuum of care monitor was developed. Some monitors forayed into the employment of non-proprietary approaches to software connectivity. While patient monitoring systems are located in areas such as the Emergency Department, Operating Room, and Intensive Care, it was entirely common for one of those areas to have monitors from one manufacturer and of different make and model from monitors in another area of the same hospital. However, in 1990 and onwards, transport monitors appeared which provided more technical impetus to having a hospital wide standardized monitoring system. These monitors permitted the transfer of their parameter module to a bedside monitor of the same vendor and thereby provided for one-time setup of patient connections. Systems such as the Spacelabs PC Express of 1990 and PC Scout of 1994 would allow transfer of stored trended data. The same parameter module could stay with the patient from Emergency to intensive care for example. The Spacelabs PC Express transport monitor of 1990. Note the two parameter modules inserted at the bottom. Another approach which increased proliferation of the same vendors’ monitors throughout an institution was to establish vendor specific monitoring network connections at many bedside locations so that network-compatible monitors could be connected into the monitoring network at patient bedsides where needed. This included the Spacelabs Quicknet Interface of 1994 and the Siemens “Pick and Go” system of 1996. The entire monitor would travel with the patient and, unlike regular transport monitors, would be connected to a monitoring network after travel. This foreshadowed the wireless transport monitor such as the Spacelabs PC Ranger of 1996 and the Marquette Eagle 4000 of 1999 which would remain connected to a network by their wireless link. Monitors in the 1990s also allowed for connections to other types of critical equipment at the patient bedside. Connection to other equipment such as ventilators, pulse oximeters, and infusion pumps was possible. An example was the Spacelabs flexport serial interface and their PCMS of 1990. This is advantageous if the new data can be transmitted over the monitoring network to the central and other monitors. Since equipment such as ventilators are designed with their own integrated displays and alarm signals, the challenge to the monitor was the relaying of the data and alarms in a useful way without losing key information or alarm signals. In 1995 the Spacelabs UCW monitor could interface with other hospital information systems such as the laboratory and pharmacy. This was implemented using their “Dynamic Network Access (DNA)”, called winDNA, which could run standard Windows applications. Hewlett Packard released their “LabVue” system that allowed monitors to display lab results in 1996. The HP Viridia system of 1997 incorporated the Windows NT operating system. The CRT is heavy by nature and therefore not ideal for transport monitors. Monochrome LCD displays appeared in the early part of the decade for transport monitors such as in the HP component transport system and the Datascope Passport monitor. Flatscreen amber electroluminescent displays were also deployed for a few years beginning around 1990 in the Spacelabes PC Express and later with the Marquette Eagle system for example. This was followed by color LCD’s by the end of the decade. The use of flat and thin monitors (no CRT) meant that the patient monitors themselves could in theory be more flat in shape with a smaller footprint. The Marquette Eagle and Siemens SC9000 are two examples of monitors with a flattened shape. Another design change was to shift the location of the patient connections to the side of the monitor. This design change allowed parameter modules to be inserted into the side of the monitor instead of the front thereby keeping the dimensions of the monitor flatter with less depth. The parameter modules which were so commonly employed in the 1980's and 1990's began to be replaced by "dense" and more compact integrated or configured parameter acquisition panels. The Siemens SC 9000 of the late 1990's. Note the configured cable connections along the left side and the short depth of the unit. Monitors of the 1990’s usually had to be configured for the type of location such as the OR versus emergency. Appearing at the end of that decade and into the new century was a new generation of monitors which were designed to be flexible enough to remain with the patient through various stages of acuity and during transport. These monitors support the continuum-of-care approach to patient care. These monitors leveraged the increased miniaturization of parameter modules and the lighter flat-screen technology. Transport monitors with their more limited subset of parameters are replaced by the more capable continuum of care monitors. An example is the Siemens Infinity SC 9000XL monitor. The Siemens Infinity monitors also offered connectivity to the internet in 2000. This allowed the clinician to use the internet or the hospitals intranet to remotely view a particular bedside monitors real-time waveforms, vital signs and trends. We anticipate that the ubiquitous PC will become used as the primary monitoring system component. In the prior century, the graphical and computational performance of the PC lagged the capabilities of dedicated computer display systems used for monitors. This has changed and offers the potential for savings in hardware costs. Additional electrical safety measures may still be necessary for PC’s used in this medical application. An acquisition system consisting of input connections and signal conditioning circuitry will be required and could be developed as a stand-alone brick with a conventional interface to the PC via USB or Bluetooth. The monitor display will evolve to be 8K high definition and will use the wider aspect ratio of 16:9. This wide screen is advantageous for monitors since a longer waveform can be displayed. The high-definition display would be advantageous for the display or overlay of ultrasonic and radiological images retrieved by the monitoring system. Software will become predominate over hardware considerations for monitors and software updates via the web should be possible. Networking will be mostly wireless in the future and be facilitated by the web. Patient data will be available on the network and become part of the patients’ electronic medical record. This could be accessed remotely by a clinician for real time and historical analysis. Just as arrhythmia interpretation became standard in the 1980’s, as a means to facilitate rapid diagnosis of potentially serious patient conditions, we predict that interpretation of data from all sources available to the monitor will occur via AI. That is, the monitor will assess the physiological data, lab results, patient history and condition to interpret the patients’ status and to relay this to the clinician. The clinician will undoubtedly want to verify the monitors’ interpretation with their own assessment. Eventually, like an automated external defibrillator, the importance of the display may diminish and even disappear. The primary goal or output of the monitoring system could be an AI driven advisory type assessment of the patient. The acquired data could be reviewed in detail at a workstation if needed. New parameters to be measured will arise and improvements in current measurement technique will certainly occur. Our understanding of the relative importance of the parameters will increase and we will learn what to watch for. The trend towards the development of non-invasive techniques will continue. There may be some overlap between physiologic monitoring and medical imaging. That is, medical imaging techniques may yield more physiologic information from its inherent non-invasive approach and signal processing. Eventually physiologic monitors as we know them will probably become obsolete and may be replaced by nanotechnology instruments capable of elaborate analysis of body chemistry and condition. If these devices are cheap and plentiful, it would allow more predictive medical assessments leading to better preventive and personalized care. 1950: First ‘modern’ monitor reported in use. 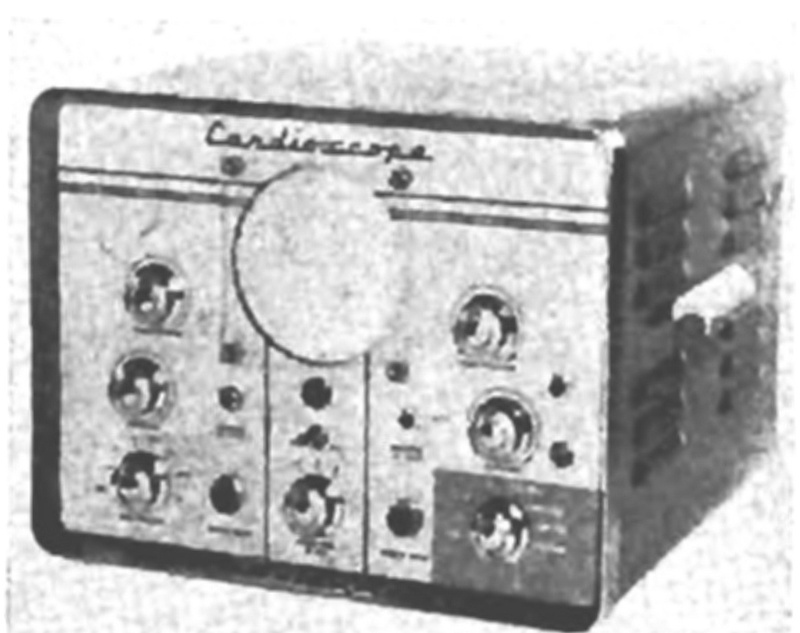 1954: First appearance of production monitors (Cambridge cardioscope). 1956: Production monitors enter clinical use (Electrodyne PM-65). 1966: Non-circular displays and Nixie numeric indicators are employed. 1968: Heart rate included on CRT as a progress-bar indicator. 1970: The memory monitor appears which allows for a non-fade display. Isolated inputs appear for added patient safety. 1975: LEDs employed as numeric indicators on physiologic monitors. 1978: Monitor displays include heart rate as a numeric on the CRT. 1980: Modern modular parameter modules appear. 1983: Arrhythmia analysis available at the bedside. The first color physiologic monitors appear. 1990: Transport monitors appear which could transfer the same patients’ module and cabling to a compatible bedside monitor. Flatscreen (non-CRT) monitors appear on physiologic monitors. 1995: Some monitors can run Windows applications. 1996: Continuum of care monitors appear and parameter modules begin to be replaced by configured acquisition panels on the side of monitors. 2000: Internet connectivity at the bedside becomes available. W. H. L. Dornette, Editor, Instrumentation and Anesthesia, F. A. Davis Company, Philadelphia, 1964. H. W. Day, History of coronary care units. Am J Cardiol. 1972;30:405-407. B. R. Klein, Introduction to Medical Electronics – for Electronics and Medical Personnel, Tab Books, 1975. L. Cromwell, Medical Instrumentation for Health Care, Prentice Hall, 1976. F. Biloon, Medical Equipment Service Manual: Theory and Maintenance Procedures, Prentice Hall, 1978. R. J. Traister, Principles of Biomedical Instrumentation and Monitoring, Reston Publishing, 1981. Evaluation of Operating Room Monitors, ECRI Health Devices, April 1982, Vol. 11, No. 6. Physiologic Monitoring Systems Evaluation, ECRI Health Devices, Jan-Feb 1999, Vol. 28, Nos. 1-2. Trends in Physiologic Monitoring Systems, ECRI Health Devices, Oct 2004, Vol. 33, No. 10. Physiologic Monitoring Systems Evaluation, ECRI Health Devices, Jan 2005, Vol. 34, No. 1. Additional sources: “Modern Hospital”, “Modern Healthcare” as well as “Anesthesia and Analgesia” featured sections on new products and hosted advertisements from monitoring equipment vendors.